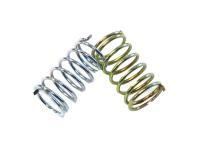 clutch springs Polini for Piaggio. Replacing the spring is necessary when tuning engines, the idea is to prevent the initial response from the variator therefore increasing the engine speed, the the increase power with delayed engagement will increase the power at pull off. Markings on the spring help you identify the strength of the spring for example, a spring marked 2000 RPM will delay the reaction by 2000 RPM. The greater RPM spring will provide you with the greater power.